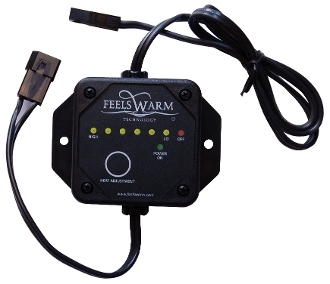 The Thermal Control Unit (TCU) is an optional add-on item for the FeelsWarm heating mat. Its function is to lower the temperature of the counter if desired and to turn the unit on/off with a button but it not necessary to operate the mat. (A heating mat without the TCU can be turned off by unplugging the transformer). Click here to see a 2018 survey of TCU usage by FeelsWarm customers.